Embark offers the most comprehensive Dog DNA testing on the market. They screen for more than 160 diseases, a dozen traits, and compare your pet with their database of more than 250 breeds to determine his or her ancestry. The detailed results are well worth the money. We strongly recommend Embark for your dog's DNA test, and they earn our highest rating. Wisdom Panel offers two tests, one for breed detection only and another for breed plus disease susceptibility. Their tests are priced affordably, and their turnaround time for results is one of the best we've seen, at 2-3 weeks from the time your dog's sample is received. 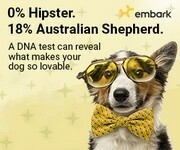 This is a great option for your dog's DNA testing. Live Well Testing is a reputable company for both humans and pets alike. Their Canine HealthCheck screens for more than 150 conditions and diseases to determine what susceptibilities your pet has. Although you won't find out your dog's breed, you'll still get a good amount of information to help your pet live a healthy life, from a company with a great reputation. EasyDNA is a trusted service for DNA testing around the world, and is one of the few companies that also offers testing for birds, cats, and horses. You can select from four tests, including Parentage, Breed, Allergy, and Inherited Conditions. You do have to pay for each test, so this service is best for aren't looking for a comprehensive report.